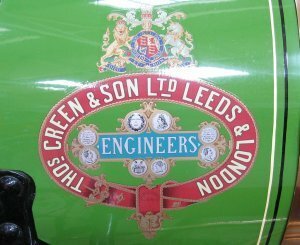 Thomas Green & Son, Ltd. were engineers who manufactured a wide range of products at the Smithfield Foundry, Leeds, United Kingdom. One of the products that Greens are most known for, the lawnmower, was first constructed in 1855. The earliest lawn mower was patented by E. B. Budding of Stroud, Gloucestershire in 1830. Green improved the Budding design by adding a rake to lift the grass and reducing its weight. In 1858 Greens machine won first prize at the first lawn mower trial conducted at the London Horticultural Gardens, Chiswick. A short-lived product, introduced in 1902, was the steam-powered lawnmower, targeted at groundsmen. Greens produced mowers in a wide range of sizes from 8in to 42in and these were given grand names, such as Silens Messor and Multum in Parvo, and along with Ransomes of Ipswich and Shanks of Arbroath, dominated the market until the First World War.